We offer Diamond Necklaces these are well polished and smoothly finished these gemstones are widely demanded and applauded by our valued clients. All the products offered by us are well tested and analyzed on distinct parameters. We offer them at competitive prices at international standard. They are highly appreciated for their unmatched in designs and perfect in finish. We offer these necklaces in 14k, 16k and 18k gold. 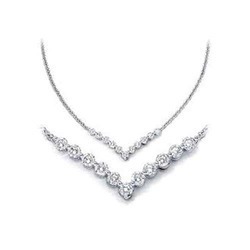 Our Diamond Necklaces are quite precious but they have a stunning look with breathe taking appearance. These necklaces are fitted with various kinds of stones like sapphires, pearls, rubies, emeralds etc. they not only make the diamonds looks the best but also attract the viewers towards the wearer. Our elegant and outstanding designs cannot match with any other competitors in the industry. The glossy look, shinny appearance and the perfect finishing touch make our product the number in the entire industry. 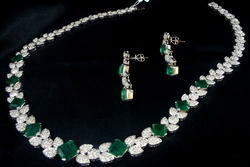 We offer Diamond Necklace Studded with Natural Emeralds. These are well polished and smoothly finished these gemstones are widely demanded and applauded by our valued clients. All the products offered by us are well tested and analyzed on distinct parameters. We offer them at competitive prices at international standard. They are highly appreciated for their unmatched in designs and perfect in finish. We offer these necklaces in 14k, 16k and 18k gold.